Dream horses (tier 9) are not available from breeding and take a lot of time and effort to achieve. There are 3 types of dream horses. Pegasus (Arduanatt)– This dream horse is a winged horse which uses their large wings to safely drop from high places. They do not “fly”, but can jump off cliffs and safely glide downwards at high speeds. Unicorn (Diné) – This dream horse is a friendly mount which can buff targets to give them higher DP/Evasion and can also heal them. The unicorn is a supportive mount which can prove useful in battle. Doom – This dream horse is not as fast as the other dream horses, but has more powerful attacks and stronger horse skills. They use fire and explosions to destroy their enemies in battle. Pegasus and Unicorn (Dineh) are currently only available in EU/NA. This is also known as a Courser horse and it will have a gold horse symbol in the top right corner of it’s icon. Put the horse in the stable at Stonetail Horse Ranch. Make sure it doesn’t have any gear equipped or items in the inventory. The option “Corser Training” will be available at the bottom. The training window will open. Here you can train your horse in 3 different areas: Skill Training, Elegance Training and Strength Training. You must consume certain materials to train the horse in the different types of training. Each time you use 1 material, you increase it’s training exp by 1%. You can get a maximum of 100% exp in each training area. To awaken the horse, you will need a total of 200% training across all training areas. Going above 200% training will increase your chances of sucess but is not worth it because it doesn’t increase your chances by much and you are wasting a lot of materials that can be used on extra attempts. Stone Tail Fodder – Use simple cooking to mix any farming byproducts (Plant with Rotting Roots, Seed Half Eaten by a Bird, Premature Fruit, Mutant Plant). This is the easiest of the materials to get. Once you reach Artisan 1 in Farming, use Mysterious Seeds on your farm and breed them to get high amounts of farming byproducts. Check out our farming guide for more information. You can also obtain these by exchanging Perdiot Petal x10, which are a reward from the Narc Magic Sealing Stone bundles. Ferocious Beast Neidan – Has a rare chance of being looted when butchering Khalk or Blue Whale. You can also obtain these by exchanging Perdiot Petal x10, which are a reward from the Narc Magic Sealing Stone bundles. Breezy Conch Seaweed – Has a rare chance of being obtained when fishing. You can also obtain these by exchanging Perdiot Petal x10, which are a reward from the Narc Magic Sealing Stone bundles. Deep Blue Hoof Root – Has a rare chance of being obtained when gathering. You can also exchange Peridot Leaves x7 for Deep Blue Hoof Root. You can collect these by completing the Kamaslyvia daily quests. Check out this video for all the Peridot Leaf daily quests. You can also obtain one single material, by completing a daily quest at Stonetail Horse Ranch. The quest involves capturing a wild horse. Once your horse has a total of 200% exp or higher in training, it can be awakened. You can also gain a small amount of Swaying Wind Fragments and Rumbling Earth Fragments from the Peridot Leaf daily quests (video) and can exchange Peridot Leaf x15 for a Swaying Wind Fragment or Rumbling Earth Fragment at Old Wisdom Tree. 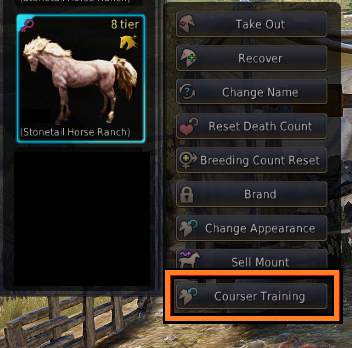 If the awakening fails, the training percentage (%) will be reduced back to 0% and you will need to train the horse again. You wil gain +1 Awakening failstack, which increases your chance of succes on your next attempt. You can also choose to use 100 Cron Stones when awakening. Using Cron Stones will reduce the training percentage to 100% instead if it fails. If the awakening succeeds, the horse will become a Pegasus OR Unicorn (you cannot choose). The horse will become a T9 with the same name. The horse will go back to level 1 and will have new stats and skills. It’s also important to note that T9 horses cannot breed. The chance of success is 1% so you are very lucky if the awakening succeeds! The horse can learn any of the skills that a normal horse can learn (except Two Seater skill), as well as special dream horse skills. Learning skills works exactly the same as with normal horses and is completely random. Courser’s Spirit – The horse will automatically regenerate health and stamina whilst parking. This skill is automatically learned and mastered by Pegasus, Unicorn and Doom. Double Jump – The horse can jump a second time whilst in the air (can also be used with high jump). This skill is automatically learned and mastered by Pegasus, Unicorn and Doom. S: Charge – The horse can perform a second charge immediately. This skill can only be learned if the horse has the “Charge” skill. Wings of the Wind – This skill is used with double jump. The horse will glide and fall damage is reduced by 100% for a period of time. This skill is automatically learned and mastered by Pegasus. Wings of Freedom – This skill allows Pegasus to turn whilst gliding. Earth of Life – This skill heals a maximum of 10 friendly targets (+300 HP and +300 MP/WP/SP per 3 seconds for 30 seconds in total). This skill is automatically learned and mastered by Unicorn (Dineh). Earth of Protection – This skill buffs a maximum of 10 friendly targets (+10 DP and +10 Evasion for 30 seconds). Footsteps of Dark Flame – This skill leaves a trail of fire behind you which damages enemies. This skill is automatically learned and mastered by Doom.